Physicist specializing in acoustics and atomic and nuclear physics. Physicist at the National Bureau of Standards (1929-30), on faculty at Case Institute of Technology (1930-76) and served as head of physics department (1940-58). Performed research in underwater sound during World War II. January 11, 1908Birth, Willoughby (Ohio). 1929Obtained B.S. in Physics, Case School of Applied Science, Cleveland (Ohio). 1929 – 1930Physicist, Radio Section, National Bureau of Standards. 1930 – 1976Instructor (1930-37), Assistant Professor (1937-39), Associate Professor of Physics (1939-41), Head of Physics Department (1940-58), and Ambrose Swasey Professor of Physics (1941-1976), Case School of Applied Science, Cleveland (Ohio). 1933Obtained M.S. in physics, Case School of Applied Science, Cleveland (Ohio). 1934 – 1936Assistant (1934-36) and Instructor (1936) in Physics, University of Chicago while on leave from Case School of Applied Science. 1935Obtained Ph.D. in physics, University of Chicago, Chicago (Ill.). 1942 – 1945Chairman, Hydrophone Advisory Committee, U.S. Navy. 1942 – 1946Director, Underwater Sound Reference Labortories, Office of Scientific Research and Development. 1943Scientific representative to the United Kingdom. 1944 – 1946Member, Underwater Sound Measurements Advisory Committee, U.S. Navy. 1945 – 1948Member, Acoustics Panel, Joint Research and Development Board. 1946 – 1949Physicist (summers only), Radiation Laboratory, University of California, Berkeley. 1951Participated in Project Vista at California Institute of Technology, a secret study to examine how existing and emerging technologies could repel a Soviet invasion of the rest of Europe. 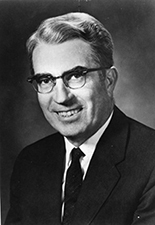 1955Physicist and Acting Technical Director (summer only), Atomic Energy Division, Phillips Petrol Co.
1959 – 1961President, Associated Midwest Universities. Physics -- Study and teaching. Ultrasonic waves -- Military applications. From the Robert S. Shankland biographical file, Niels Bohr Library & Archives. Second wife, married in 1971. First wife, married in 1931. She died in 1970. They co-wrote multiple articles. Ph.D. advisor at University of Chicago on the photon theory of scattering. Co-wrote the Annual Report of the Acoustics Panel of the Research and Development Board in 1948. Co-wrote the Annual Report of the Acoustics Panel of the Research and Development Board in 1949. Co-wrote the Annual Report of the Acoustics Panel of the Research and Development Board in 1948 and 1949. Collaborated on a reexamination of Dayton Miller's work on absolute motion. Both employed at Case Institute of Technology. Both employed at the National Bureau of Standards. Worked under Colpitts at the Office of Scientific Research and Development. Both employed in the Office of Scientific Research and Development. Both employed in the Office of Scientific Research and Development and Case Institute of Technology. Worked under Tate at the Office of Scientific Research and Development. Studied together at University of Chicago. Obtained B.S. and M.S. in Physics. Instructor, Assistant Professor, Associate Professor of Physics, Head of Physics Department, and Ambrose Swasey Professor of Physics. Physicist and Acting Technical Director. Director, Underwater Sound Reference Laboratories. Obtained Ph.D. in physics. Assistant and Instructor in Physics. Chairman, Hydrophone Advisory Committee and member, Underwater Sound Measurements Advisory Committee. Bicentennial session on the history of pioneering American physicists [sound recording] / 1976 April 28. Oral history interview with Robert S. Shankland, 1974 August 20 and 21. Robert S. Shankland papers, 1935-1982. Case Western Reserve University Physics Department history, 2009. Oral History interview with Lorence Fraser, 1983 March 9. Recorded version of the speeches at the unveiling of the bust of Albert Abraham Michelson for the Hall of Fame for Great Americans at New York University, 1973.